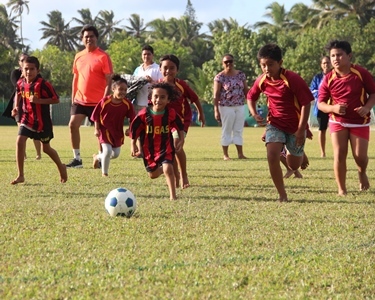 In the U8 mix division, Titikaveka sit comfortably at the top of the table with 16 points and only need to win one of their three remaining matches to take out top honours for the 2016 five-a-side competition. In the U11 mix division, it is Titikaveka again who leads the pool with 12 points; however, they will need to win all their remaining matches if they want to take out the competition. Following closely behind them is team Katukangas on second with 11 points, while Wild Wild West chases on 10 points. Titikaveka will need to capitalise on their lead as they front up against tough contenders Wild Wild West this evening. In the U14s competition Tupapa leads in both the girls and boys divisions with an equal 10 points. Both teams will need to play sharp and smart in today’s round of games if they want to extend their lead. The first lot of matches to get underway today will be the U8 mix division at 4:45pm, to be followed by the U11 mix at 5:10pm and the U14 divisions at 5:25pm. You can catch all of this action and fun down at the CIFA Complex.